The aluminum composite material (ACM) – is increasingly employed in commercial buildings and other diverse projects. 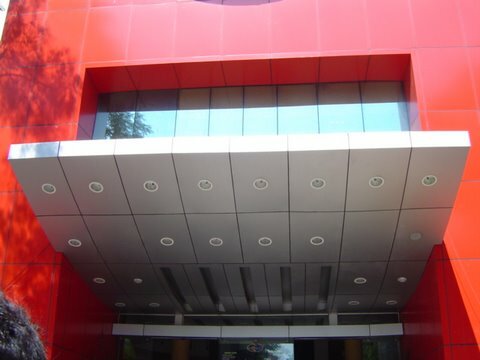 It is a coating widely used in the United States, Europe and Asia, which gives the facade a modern and technological aspect. Its flexibility and versatility give installers bold models, whether in new works or retrofit of old buildings, whose facades require new coating. Check out the new supplies from Kingaluc ACP. Composed of two aluminum blades with polyethylene core, the ACM presents rigidity, flatness and good thermal and acoustic performances. However, the performance of this product, as of other high technology products, depends on a good installation. Therefore, it is necessary a good qualification of the professionals, from the machining and processing until the installation. The specification of this sign board aluminum composite material offered by Sign Board ACP for the facade advertising should consider discussions, verifications and decisions of aesthetic, technical and economic considerations. Considering the aesthetics of the building involve how does the architect want the building to be seen? What does it look like? What visual effects do you aim for? From this type of discussion, decisions begin to emerge that will impact on various details of the coating. Whether the choice of colors and brightness, the option for standard colors, or the definition of a unique color, in this case, the Kingaluc Aluminum Coil supplier serves in all types of aluminum sheets. Also volumes, modulations, directionality and rhythm of the facade are decisions that must consider the existing dimensions for these materials. The aluminum composite materials have the great advantage having a thermoplastic material as the core; they are much lighter than other materials with the same rigidity. These are decisions that will have consequences for the aesthetics as well as the systems of fixation of the panels. Pool Opening – Why Hire a Professional?